Wording changes welcomed including changing the text to the language of your choice. 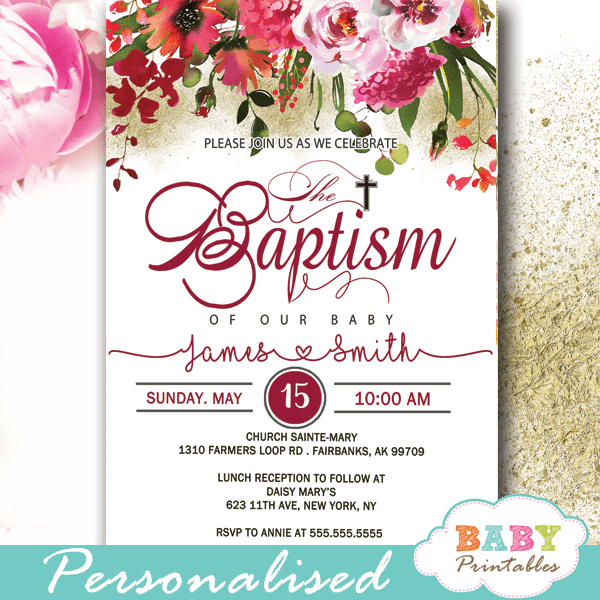 Beautiful hand painted floral wreath succulent baptism invitations to celebrate your little girl’s christening. 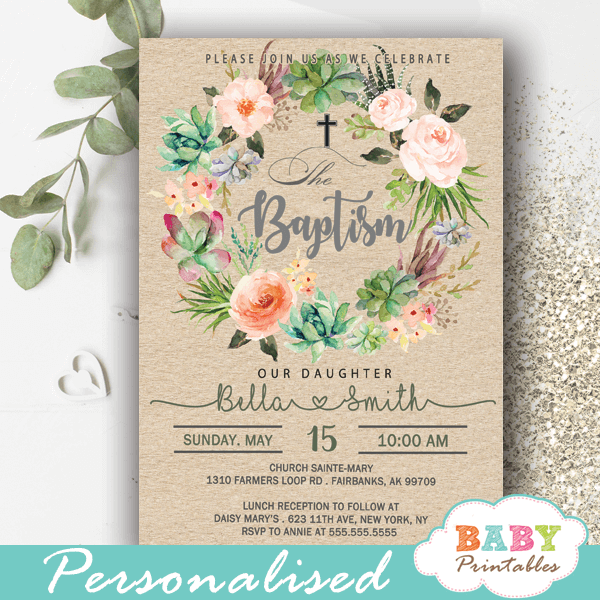 The baptism invitations feature the cross inside a wreath of watercolor succulents, pink roses and elegant green foliage against a faux Kraft paper texture backdrop. 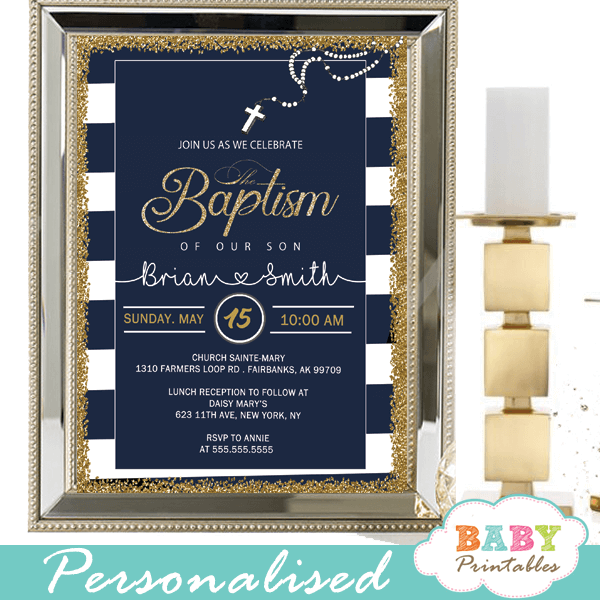 All baptism invitations templates can be adapted to the christening of twins or adults. 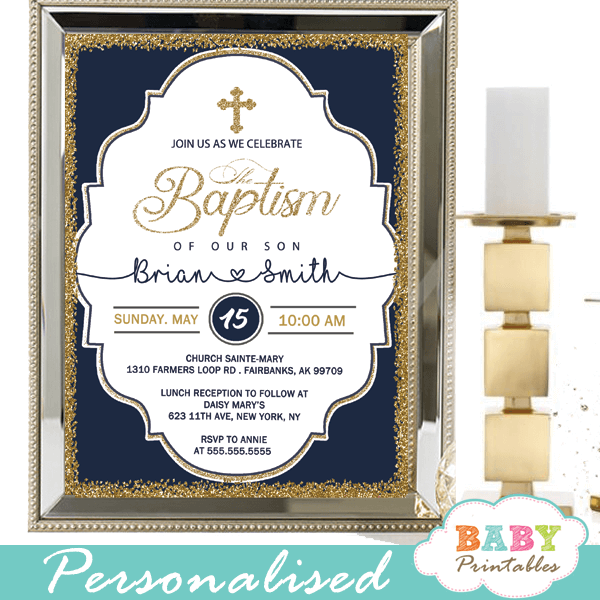 ★ Click to view our collection of christening Invitations. ✝ Please note that the Latin cross can be replaced with your preferred variant ie Greek, Orthodox, Maronite, Coptic etc. Simply mention it in the Comments box or via email. The listings are displayed in English by default. However, you have the option of replacing the text in the language of your choice: Spanish, French, Greek, etc. Simply supply the text in your preferred language. Las Invitaciones Para Bautizo también están disponibles en español. I will ‘paste’ the wording you provide to ensure its accuracy so please submit the wording exactly as you’d like to view on the invitation. 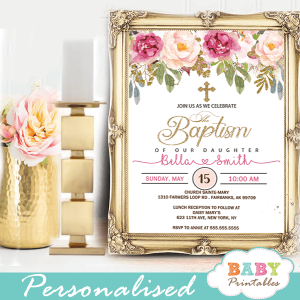 Of course, you can personalize it for any event whether it’s a birthday party, bridal shower, wedding, rehearsal dinner, engagement, bachelorette etc.